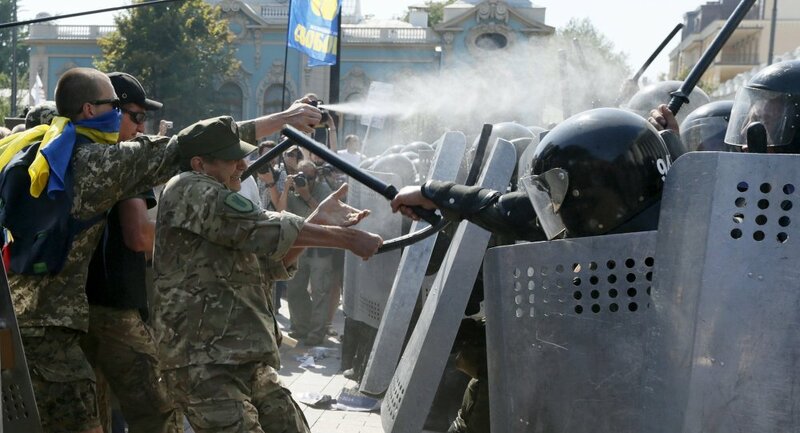 A serious standoff may begin between Kiev and Ukrainian extremist groups in autumn as a result of the recent violent clashes near the Ukrainian Parliament, the Ukrainian news outlet Vesti reported. On Monday, the Ukrainian Parliament passed a constitutional amendment draft proposed by President Petro Poroshenko on decentralization. After the vote, violent clashes broke out in front of the parliament building. They left 124 people injured and one serviceman killed. The radicals who staged the clashes might have been aware that Poroshenko’s proposals are only advantageous to the West and presume no special benefits for Donbass. The clashes prove Ukrainian radicals want the revolution to continue and the Ukrainian army to win the war at any costs. However, so far the situation is rapidly getting out of control, the article read. "There are two options possible now – either Kiev would manage to maintain the public order or we would have another Somalia but in the middle of Europe. Now it is an either-or situation," Ukrainian political analyst Konstantin Bondarenko was quoted as saying by Vesti. "Either Poroshenko supporters will stage a 'night of long knives' for radicals, or radicals will stage a ' St. Bartholomew night' for the president," he added. It is highly possible that a new, third Maidan (revolution) is currently in preparation in Ukraine, especially taking into account that winter is coming, "the favorite period for Ukrainian revolutions," Vesti claims. "I wouldn’t be surprised if the clashes result in a series of political murders or the level of radicalization reached its height. It may provoke more public unrest. The third Maidan would be a bloodbath," Ukrainian political analyst Andrei Zolotarev was quoted as saying by Vesti. The structure of the current parliamentarian coalition is practically destroyed, and the coalition itself may be ruined by the end of the year. Experts have different opinions on when a new parliamentary election may be held. However, it is already clear that an "internal opposition bloc" has formed in the parliament, including the Radical Party and the Self Reliance Party as well as separate members of the Fatherland Party, the article read.